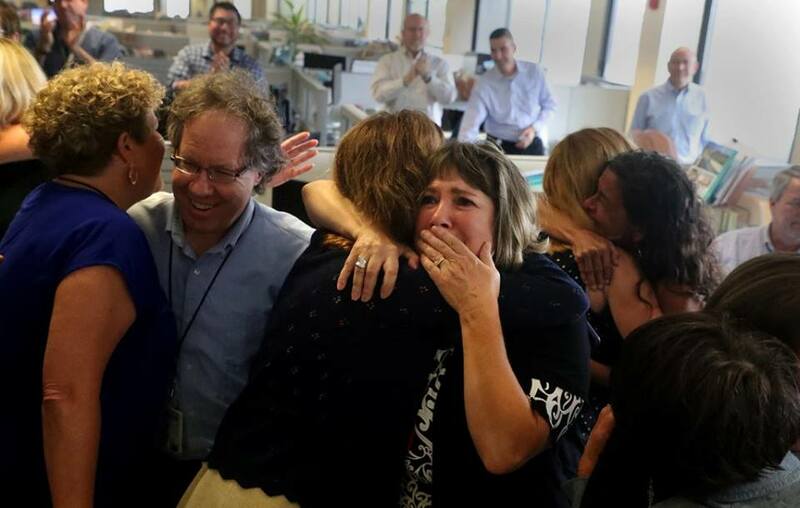 I was thrilled to see the South Florida Sun-Sentinel win the Pulitzer Prize for public service this week. The Pulitzer judges cited the Sun Sentinel’s stories for “exposing failings by school and law enforcement officials before and after the deadly shooting rampage at Marjory Stoneman Douglas High School.” This is the second time the Sun Sentinel has won the Pulitzer for public service reporting, the most prestigious Pulitzer award. I worked at the Fort Lauderdale newspaper in the ’80s after graduating from Northwestern Univesity, writing about the airlines, including Eastern Airlines. There was a lot of labor unrest, with former astronaut Frank Borman at the helm. It culminated in Eastern’s Chapter 11 bankruptcy filing. A colleague was Michael Connelly, now a mystery writer. Other longtime friends still work there. One of them, Doreen Christensen, is pictured in The New York Times in a newsroom photo. Congratulations Sun Sentinel friends and former colleagues! It was a challenging and heartbreaking assignment in extreme circumstances. And the staff has been shrinking in the wake of continued disruption in the newspaper business. A link to the stories is here.